Disconnect the front seat belt lower fastener. 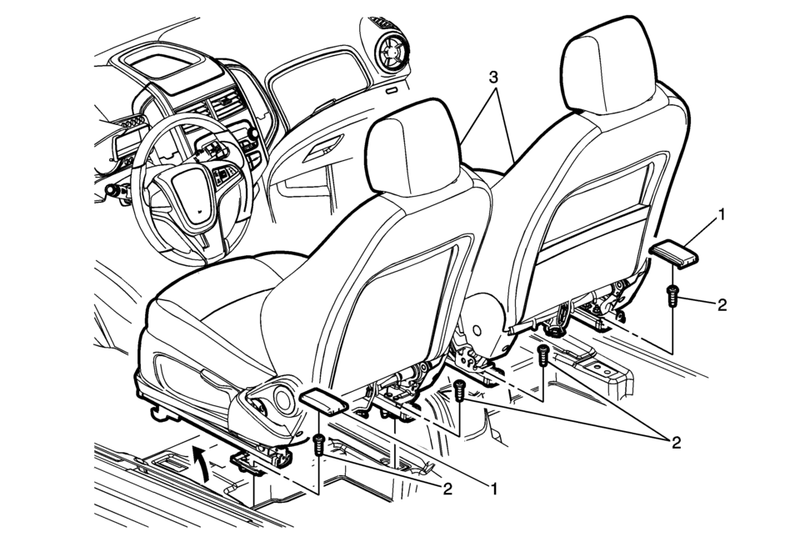 Refer to Driver or Passenger Seat Shoulder Belt Replacement. Disable the front seat belt tensioner fastener by removing the cap, and cover, if equipped. Refer to SIR Disabling and Enabling. Remove the front seat riser cover. Refer to Front Seat Riser Finish Cover Replacement. Adjust the seat to the full forward position to gain access to the rear bolts. With the aid of an assistant remove the front seat, by tilting the seat forward and then lifting and pulling the seat rearwards to disengage the front hooks.